This follows on from my previous post on Jesus, the radical reformer. 18 Then the Jews demanded of him, “What miraculous sign can you show us to prove your authority to do all this?” 19 Jesus answered them, “Destroy this temple, and I will raise it again in three days.” 20 The Jews replied, “It has taken forty-six years to build this temple, and you are going to raise it in three days?” 21 But the temple he had spoken of was his body. 22 After he was raised from the dead, his disciples recalled what he had said. Then they believed the Scripture and the words that Jesus had spoken. The risen body of Jesus is the one true temple – the one place where God and man con come together in peace and harmony. 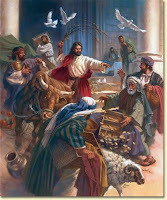 Jesus had taken charge of the temple. He was controlling the place, and dictating what true worship was. The Jewish leaders ask him: what right have you to do that? They want him to perform a miracle, to prove that he has the right to take over the place, and dictate true worship. He says if they destroy the temple, he’ll rebuild it in three days. That would have been a miracle. The temple was about 450 m (approx 1,500 ft) from N to S, and about 300 m (approx. 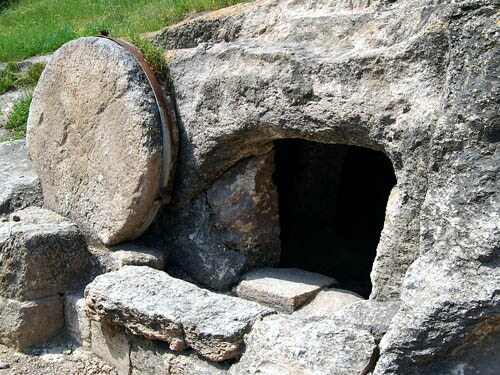 950 ft) from E to W.
But he didn’t mean the physical temple; the real miracle was his resurrection. Jesus’ resurrection is the proof of his authority to dictate true worship. 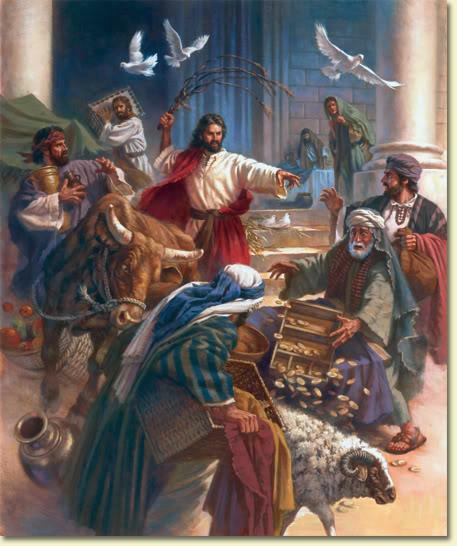 Jesus had to die to take the penalty for all our corrupt worship. Our worship, on its own, stinks. It’s always corrupt. It’s never good enough for God. Think of Jesus’ death as his once for all, eternal cleaning up of the temple; and his resurrection as a once for all, eternal rebuilding of the temple, where God can have acceptable, pure worship, led by the risen Jesus himself. As people who now, in Christ, worship God acceptably, let’s be like Jesus – zealous for true worship. We’re too relaxed. We’re too used to mediocrity, to false worship. Every shopping mall is a temple to the god dollar. The football field is the temple for many blokes. Islam says Jesus is a prophet, but refuses to worship him as God. Hinduism worships a pantheon of gods. We’re too comfortable with this. The culture of tolerance has doused our fervour. Personal godliness, and a passion for evangelism, spring from the same root: zeal for the glory of God, in Christ. Christ was consumed by his zeal for pure worship. He expects nothing less from us.